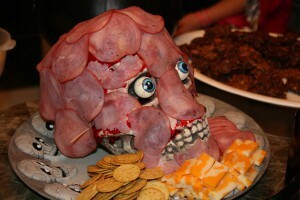 One of my favourite dishes to serve at a Halloween party is Meathead (anyone remember All in the Family?). It’s an absolute hoot to bring out as it shocks and delights your guests, and is actually super-easy to prepare. It’s basically a meat-covered skull that your guests can pick apart and eat, which makes it great as either an appetizer or as part of your main course presentation. The creep factor is undeniable and the look on people’s faces when you bring it out is absolutely priceless. Wash the skull thoroughly with anti-bacterial dish soap to ensure it’s sanitary. The food won’t be touching it directly, but safety must come first. Prepare one pack of red Jell-O (I prefer Black Cherry as it’s darker) according to the package instructions, but with one difference: use only half the suggested amount of water. This will help make the Jell-O stickier, which is precisely what we want. Pour the Jell-O mixture onto a baking sheet to make it as thin as possible. Once the Jell-O has completely set, move on to the next step. 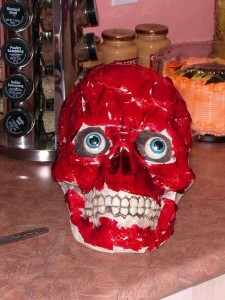 Slice the Jell-O into strips and lay over the skull. The Jell-O should cover any surface that will come into contact with the meat. This will provide a protective layer and will give the appearance of a red layer of blood/muscular tissue beneath the meat. Place cold cuts onto Jell-O. Cut into smaller strips first if desired, or if they are not sticking well. 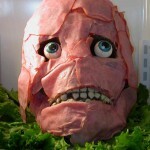 Shaved ham generally provides the most realistic look for a burn victim. Place Meathead onto a serving platter and garnish with lettuce or as desired. Serve with cheese and crackers if desired. Provide toothpicks for guests to pick off the meat. Tip: For a nice alternative, try substituting the meat with a pate or a cream cheese dip. Spread it thick over the Jell-O layer and serve with crackers. Your guests will have a great time scooping up and eating parts of Meathead’s face! Check out more great Halloween recipes in the Food & Drinks section, or get some party planning advice in the Hosting section. So people actually eat this?? Is it good? It honestly looks disgusting but I have a feeling i shouldn’t judge a book by it’s cover! Lol. Great recipe though, and it LOOKS DOPE! Thanks Matt. It’s no different than putting a traditional meat and cheese platter out, except for how the food is presented!